In celebration of the official start of summer (and as a result of the horrid levels of heat/humidity in Minneapolis), this weekend we broke out the ice cream maker. As Tom mentioned, we took home a pint of strawberries from the Midtown Farmer’s Market and they were starting to get a little funky after a couple of days in this heat. I spent some time hulling the teeny tiny somewhat rotten (I mean really ripe!) strawberries while Tom prepared a simple syrup on the stove with ½ cup of of water and ½ cup of sugar. When the strawberries were ready, Tom pureed them in the food processor and added the syrup, tasting for sweetness as he went. When the mixture was just right, we poured it into a bowl to refrigerate overnight. 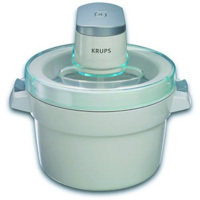 The next day, after just 15 minutes of going round and round in our Krups GVS142 the sorbet was ready to go in the freezer awaiting the dessert hour. It was so red! And so delicious! I’m so glad we gave our ice cream (and sorbet) maker a second try. Though we’ve had it for a year, we haven’t used the thing much and so far have felt a bit of single-purpose-kitchen-electronics-buyer’s-remorse. After reading a glowing review of this model in Cook’s Illustrated, I had to have it, and was very disappointed when I realized Krups had stopped making it—hence eBay. After two lost auctions, I won the third and was ready to present Tom with the surprise. In the end, the quality of the ice cream we made last summer didn’t seem worth the effort; plus, loads of heavy cream and whole milk took up too much space in the fridge. It seemed easier to just buy our ice cream and sorbet by the pint or half-gallon when the mood struck. We’ve shared with you our love for Talenti in the past, and homemade ice cream just wasn’t reaching that level. BUT. 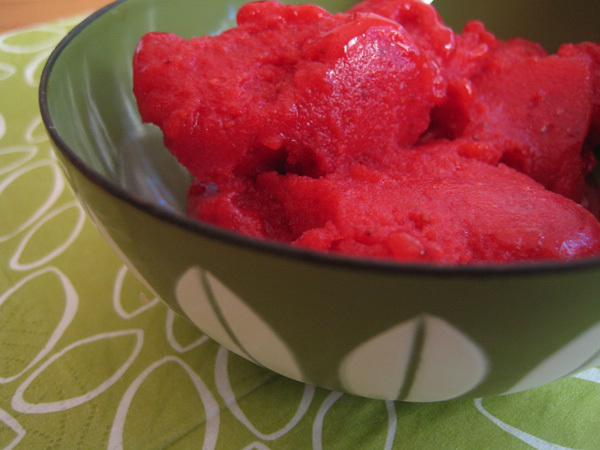 We never tried making sorbet. So far, our homemade ice cream hasn’t convinced us to skip the grocer’s freezer, but homemade sorbet puts even Talenti to shame. I can’t wait to see what other fresh fruit the market will bring. This entry was posted by Martha on Tuesday, June 23rd, 2009 at 11:52 am and is filed under Farmers Market, Recipes. You can subscribe to responses to this entry via RSS. I ate this sorbet yesterday. It is the reddest strawberry-flavored anything I have ever had. Plus, it was SO FRESH and SO GOOD that I think you should start up a sorbet business in the back alley (sell the recipe to Common Roots, what? ).